Large, fragile, valuable, and awkward items – all require special protection during the transportation process. While the proper packaging is undoubtedly important, custom crating is still the best way to protect any type of cargo in transit, especially when it comes to shipping art and antiques overseas. 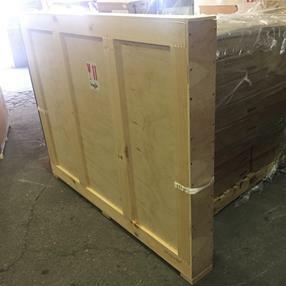 For this reason, Fine Art Shippers is proud to offer professional art crating service tailored to provide the highest level of protection for our clients’ precious possessions while they are transported from one place to another. Based on a foundation of more than 20 years of experience, Fine Art Shippers is now one of the leading freight companies in the USA for transporting large, fragile, valuable, and awkward items across the globe. However, this would not be possible without our professional art crating service that we offer both in our warehouses and on-site. Why do you need our art crating service? There are many reasons to order our art crating service, but the most important one is that it is the only way to provide your valuables with the protection they deserve. Besides, Fine Art Shippers is one of the best wooden crates manufacturers in New York, with many years of experience in building custom wooden crates for all types of items, from lightweight and sensitive objects to those weighing thousands of pounds. What is no less important, while many other art shippers prefer to have their crates made by other crating and shipping companies, we manufacture our own crates in-house, which allows us to offer our services at a very competitive price. With our comprehensive crating service, we make the process of shipping art, antiques, and other valuables as easy and safe as never before. So whether it comes to shipping a single painting or the entire collection of museum-quality items, Fine Art Shippers is the right company to come for help. Contact our team now for more detailed information!